Western architectural history can largely be captured in three words: men making buildings. This perspective willingly ignores the female, queer, trans, racialized, and non-binary shaping of our shared cities and communities—a perspective challenged in the work of Despina Stratigakos, Professor of Architecture at the State University of New York at Buffalo. Stratigakos’ contributions to feminist scholarship address the narratives, powers, people, and spaces unseen in the masculine canon of architecture. Across three books and countless articles, Stratigakos has conducted these studies in a range of contexts, from Third Reich Germany to contemporary film. By considering feminist critiques of architecture alongside complex ethical, pedagogical, and historical issues, Stratigakos gives a much-needed voice to less-visible feminist histories in architecture. Evan Pavka: Feminism is a loaded term, especially within architecture and design. How do you address it in your work? Despina Stratigakos: Feminism is so complex and used in so many different ways to intervene in narratives, assumptions, and even sources. I’ve addressed feminism from different perspectives depending on the project, but my overarching approach has been to look at issues of power in architecture and the built environment. Often it’s not as simple as having or not having power—it’s about how power is negotiated. Feminism is also a way to perceive landscapes that are not always immediately visible. My first book, A Women’s Berlin: Building the Modern City (2008), reimagined Berlin at the turn of the twentieth century from the perspective of women who identified as modern. This metropolis arose in response to new social types as women began changing their lives and pooling resources in order to build physical spaces that actually matched and supported their identities. I was interested in bringing out that alternative city, which has been submerged in more mainstream histories. As I stumbled across these fascinating sources in my research, I wondered: why hadn’t these been documented and discussed? Feminism as a way of looking encourages us to sharpen the picture and broaden the frame by considering sources that were never archived or were otherwise deemed unimportant. Feminism has helped me to see beyond the conventions of written histories, towards sources, people, and spaces that have been pushed to the margins. 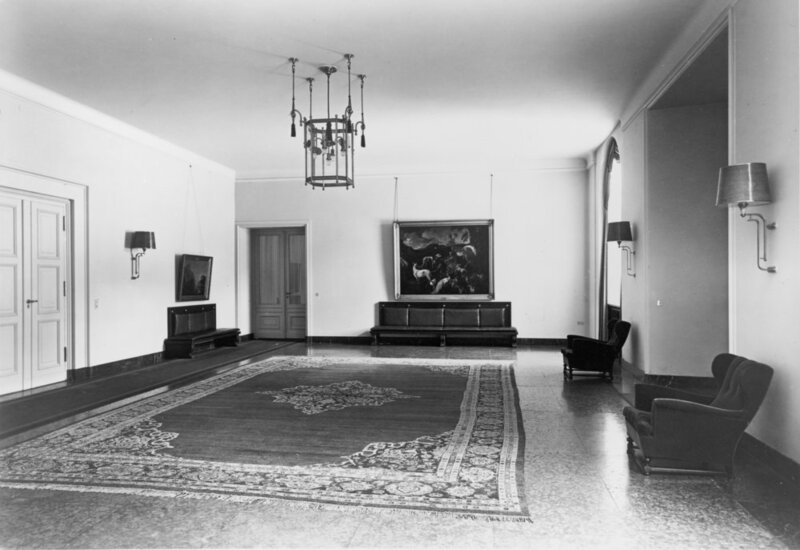 With Hitler at Home (2015), I discovered a vast, unpublished collection of personal papers belonging to Gerdy Troost—Adolf Hitler’s interior designer. For decades, Troost has been left out of historical narratives: she was a woman, she was not academically trained as an architect, and she was seen as an appendage to a man who garnered far more attention from scholars—Paul Troost, her husband and Hitler’s first architect. A feminist approach enabled me to go back and take a fresh look by asking different questions and embracing new sources. It turns out that Troost was a very important figure in the world of Nazi art and architecture. But it’s not just a matter of new sources and questions. It’s also important to revisit primary materials used by other historians to see what was edited out over time. For example, when I surveyed German newspapers of the period, I discovered that Gerdy Troost was often photographed with Hitler. She was always there, in plain sight. EP: I’m interested in your particular approach to uncovering the narrative involving Troost. How did you go about revealing the complexity of the intersections between architecture, power, social histories, and the unseen role women designers played in the Third Reich? DS: I first encountered Troost in 1993 at the Berlin Document Center, where Nazi Party personnel files captured by the Americans were then stored (these have since been transferred to the German Federal Archives). Troost’s files revealed that she had been close to Hitler and involved in high-profile art and design projects. The files included letters written by a broad range of people, from widowed mothers to high-ranking officials, asking Troost to intercede with the Führer. 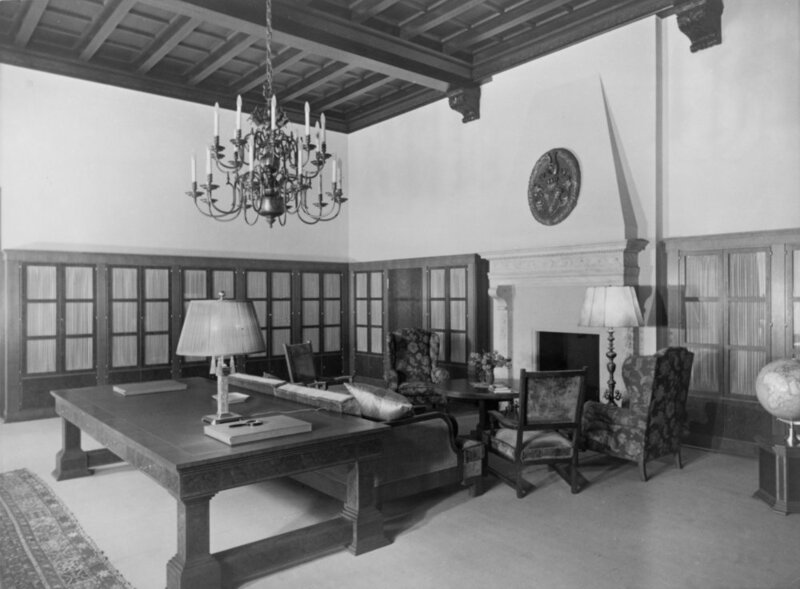 The files also contained documents relating to her work for Hitler, particularly the renovation of his homes. What was I to make of invoices for Hitler’s curtains interspersed with letters from concentration camp inmates pleading for help? After reviewing the files for a day, I was overwhelmed. I had no narrative and no framework to make sense of what I had just seen. I remember closing the files, walking away from the archive, and leaving it for about a decade. It took me a long time to figure out how I was going to write about Troost. How could I make a space for her that interwove her story with existing histories of the period while also challenging them? The strategy that I eventually developed offered a new viewpoint on the relationship of power and place, one that broadened our understanding of the Führer’s spaces. I used Hitler’s domestic environment and persona as a lens through which to reframe Nazi propaganda and included Troost as a critical part of his carefully crafted image. But before I could get there, I had to overcome this immense hurdle with narrative and framework. How do you write about someone who doesn’t seem to fit any of the norms, stereotypes, and conventions we have? In questioning those categories, feminism is not about restructuring a narrative in order to simply insert a little piece here or there, but rather about shifting the focus and perspective on a much deeper level. You can’t just drop someone into history, as if they’re a missing ingredient in a recipe. You have to rethink your whole approach. EP: The way you’ve conceptualized the narrative of her professional and private life, Troost is not cast as the typical genius or canon figure but more of an anti-hero. How do you write about historical feminist figures who did not operate as ethically as we would hope? DS: Every history will have its heroes and anti-heroes, or heroines and anti-heroines, and that’s what makes it interesting and complex. For my first book, I wrote about women who were trying to help each other to create spaces for themselves in Berlin—it was noble. Noble is a lofty word, but I really did admire them. They founded their own building cooperatives and constructed monumental architecture for themselves. At a time when women had few legal rights, it was truly inspirational. Writing about Gerdy Troost, by contrast, was tough because she was obviously not an admirable figure. She was a fanatical supporter of Hitler and remained one even after the war. When you set out to write a history, whatever it may be, the people and events live inside of your head 24/7—you can’t escape them. I spent a good deal of time being angry with or exasperated by Troost, and it’s important to be honest about how hard that is. If we only write about the people we admire, we’re going to end up with a skewed sense of history. Feminist scholars understand that and pursue subjects that demonstrate how women are as complex as anybody else and are equally capable of being on the wrong side of history. However, we’ve been slower to explore that side of architectural history. This is especially true of women’s engagement with architecture in the Third Reich. There is still much more that needs to be uncovered. After the war, there was a reluctance to dig into that history. For an older generation of feminist historians setting out to write the untold story of women in architecture, this may not have been the first thing they wanted to discuss. But now there is growing interest in documenting a broader picture. EP: How do you address these less noble figures with the same respect as someone whose contributions you admire? DS: I try to give the reader a sense of the complexity of a person and the life he or she has lived. With Gerdy Troost, there were moments when she did the right thing. As the files revealed, Germans knew she had Hitler’s ear and would write to her for help. Sometimes she ignored their pleas, but other times she did intervene despite considerable risk. She also helped Jewish colleagues, including the owners of a porcelain company in Bavaria facing deportation to a work camp where they would almost certainly have died. She fought for them, confronting Nazi authorities who opposed her—and won. Yet she also bolstered a murderous regime and used her design skills to polish Hitler’s image. After the war, she never held him accountable, instead placing the blame on Albert Speer. As a historian, I have to let the reader see the full complexity of the subject and all the messy contradictions that I myself saw in the sources. EP: Do you think that the complexity that comes from this feminist approach to architectural history has the capacity to expand the more rigid, masculinist, male-oriented canon that seems to be perpetuated in architecture schools? DS: Not everyone who writes about women is necessarily interested in critiquing the canon. When the first architectural histories of women began to appear, some followed the monographic model—the model used to create masculine architectural heroes. Their approach attempted to add to the pantheon as opposed to confronting or dismantling it. More recent feminist histories have taken a different tack, focusing instead on these master narratives to see if they really hold water. That includes revisiting canonical male figures or projects in architecture in order to offer new critical perspectives. A great example of this is Alice Friedman’s Women and the Making of the Modern House: A Social and Architectural History (1998). In the book, she discusses two of Philip Johnson’s designs that directly face one another: the iconic Glass House and the often-overlooked Brick House. She argues that the former house acts as a stage for the “transparent” performance of public domesticity, contrasting starkly with the protective privacy of the windowless Brick House. Friedman considers the duality of the designs in the context of Cold War America and the architect’s desire to control his public image, including the desire to suppress knowledge of his homosexuality. This attention to the politics of the private sphere, typical of feminist scholarship, shifts our understanding of the various ways we can understand this architectural project, deepening the layers of meaning. EP: I’m happy you brought up Philip Johnson. When a feminist critique is applied to queer histories—especially when entangled with architecture—it occasionally becomes a forced outing of individuals. And, the manner in which they employed the built environment to navigate certain social structures. How did you begin to weave Troost’s personal relationships into the scope of her design work? DS: After her husband died in 1934, when she was only 29, Gerdy Troost developed a lifelong relationship with a German filmmaker, Hanni Umlauf. They moved in together in 1939 and never parted. Although I don’t know what the exact nature of their relationship was, it’s clear from the sources that they loved one another. As two professional women living together without men or children, their lives certainly did not fit the ideal mold of womanhood in Nazi Germany. When I began writing the book, I debated whether to include this information and, if so, how. In the end, I decided that it was an important piece of the story because Troost had been entrusted with reshaping the image of Hitler’s domestic life. As a single older man with no known lovers and few other intimate relationships, the Führer seemed odd and rootless, an impression made worse by his years of statelessness. By helping to craft a wholesome domestic image for him, Troost—together with Hitler’s PR team—gave his private life a more acceptable cast. That included countering rumours about his sexuality by creating strongly “masculine” and “heterosexual” spaces. Consider, then, that this designer was a woman who herself may have had something to hide. In the book, I present this material without drawing any direct conclusions about her sexuality. You have to weigh the importance of personal information and ask: does it have a legitimate role in this narrative? These decisions are not always clear cut and they can be difficult to make. But you’ve also been dealing with these issues in your work on grave sites. EP: For me, it has to do with how much the archive tells you or how people choose to present themselves. It also becomes a question of whether the historian should extrapolate based on research, or simply lay out evidence and invite speculation. When researching the grave of Amy Redpath in Mount Royal Cemetery in Montreal, it was apparent that she wanted some speculation on her sexuality. So I had to ask: Which aspects of her personal life and sexuality, including her relationship with her maid Mary Rose Shallow, appear on the grave? Does it seem like there are aspects she wanted people to know about? Even though decades separate us, I hesitated to go further because I struggled with the ethical aspect of telling another person’s story—especially one they may have been trying to hide. These questions are complex and often more convoluted than simplified grand histories. Why is it important to insert messier narratives of history and its figures into architectural education? DS: I believe it makes history all the more interesting. After my students read about Johnson’s Glass House in Friedman’s book, they realize that modernism involves layered meanings beyond what is immediately apparent. And they end up liking it moreand wanting to dig deeper. As careful as we need to be about a person’s private life and not outing people as we write our histories, we also need to consider what it could mean for our readers to encounter narratives that resonate. Not everyone can relate to those modernist masters of impeccably straight lines. EP: In your book, Where Are the Women Architects? (2016), you make the case for Wikipedia edit-a-thons as an important means to “unforget” women architects and designers. Beyond this, how can we ensure that the increasing diversity of the unfolding present is captured and continued? DS: By fostering discussions that allow other voices to be heard, sometimes through the occasional provocative gesture. Architect Barbie was one such attempt. In collaboration with Mattel, my colleague Kelly Hayes McAlonie and I created a doll as part of the “Barbie I Can Be” career line. We launched the doll in 2011 at the AIA meeting in New Orleans along with workshops involving hundreds of girls. The doll became a social media phenomenon, eliciting strong reactions for and against. The fact that she was a doll seemed to encourage people to say things that might otherwise be hard to discuss. We had deliberately dressed her in a hard hat and a dress, which spurred a debate over appropriate attire for a construction site. This wasn’t about the doll anymore, but about professional identities. Some women felt that they should be able to wear whatever they wanted on site, while others considered that reckless or foolish. It surprised me that the most heated debates were among women of different generations. Older generations were alarmed by the younger generation’s “femme” approach to feminism, while younger women felt oppressed by their elders’ ideals. We have to be honest about this diversity of opinions among women, too. EP: Should these feminist interventions, whether in practice or pedagogy, attempt to add to the pantheon or dismantle it entirely? DS: A pantheon, by nature, is made up of figures to worship. I’m not really into worshipping anybody. So I lean toward dismantling the pantheon, not because of who is in it, but rather because of that worshipful attitude towards the masters. It’s difficult to maintain or see the complexities of human beings if you’re trying to fit them into a pantheon that expects them to be bigger than life. I would much rather embed our historical figures and our architects today in reality. Hopefully this would mean that there are many more people being written about, with many more branches on history’s tree. And this doesn't necessarily take away from the people who have been such important figures in architectural history. Rather, it means making space for a richer, larger, more complex group of people, who we can think of as our forbearers rather than our gods. Evan Pavka is a Toronto-based writer, editor, and educator. His writing has appeared in Canadian Interiors, Pidgin, and Canadian Art, among others. He currently teaches design studio as well as contemporary architecture and design history at Ryerson University. Despina Stratigakos is an architectural historian, writer, and professor in the School of Architecture and Planning of the University at Buffalo, State University of New York. She has published extensively on issues of power and diversity in architecture. She is currently writing her fourth book, which explores the Nazi occupation of Norway and Hitler’s architectural plans for the north. Discussing collective, administrative, and professional bodies with Jennifer Cutbill. Discussing new models for professional contribution with Andrea McLean. Discussing approach over gender and its power in creating new narratives with Jane Cox.